The remains of 10 Chinese soldiers who died in the 1950-53 Korean War arrived in Shenyang, Liaoning province, on Wednesday, in the latest handover of such remains by the wristbands with a messageRepublic of Korea. The transfers usually have been made days before Tomb Sweeping Day, the Chinese festival for commemorating the dead, which falls on Friday. A solemn-looking crowd of more than 200, all in black, paid tribute as an Ilyushin Il-76 transport aircraft came into view and landed at the Shenyang Taoxian International Airport at 11:36 am. Two fighter jets escorting the aircraft swept over the crowd. The People's Liberation Army Air Force plane carried the remains and 145 belongings of the fallen soldiers who fought the ROK's army and United Nations forces led by the United States on the Korean Peninsula nearly 70 years ago. 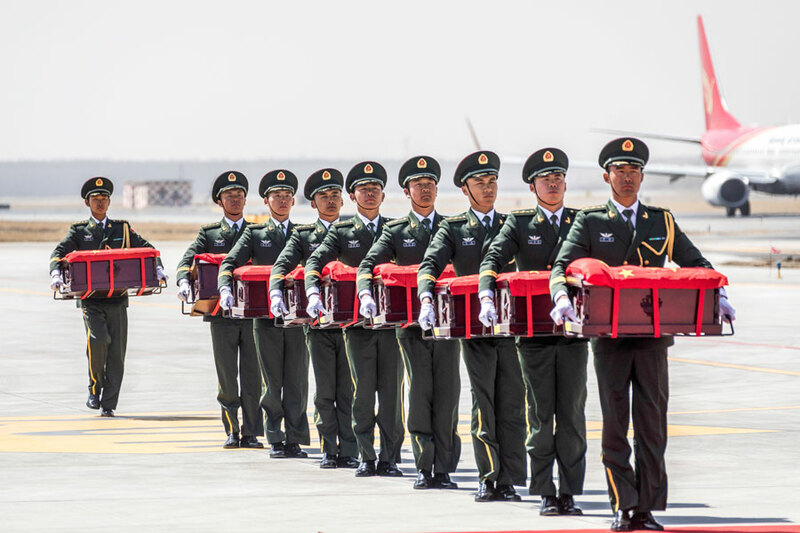 The brown caskets, each covered by China's national flag, were carried off the plane by 10 Chinese guards of honor. A brief ceremony was held at the airport to welcome the fallen heroes home, and then the caskets were loaded aboard two coaches and driven away. The remains will be buried in a martyrs' park in Shenyang in a ceremony on Thursday, according to the newly created Ministry of Veterans Affairs. Earlier on Wednesday, a transfer ceremony was held at Incheon International Airport in the ROK. It was the sixth transfer of its kind since the end of 2013, when the ROK began exhuming the remains of Chinese soldiers buried in Paju. The remains of 589 soldiers were returned by the ROK between 2014 and 2018 on five occasions ― 437 in 2014, 68 in 2015, 36 in 2016, 28 in 2017 and 20 in 2018. China and the ROK have agreed to continue the transfers based on friendly exchanges, practical cooperation and a humanitarian spirit. The ROK's Ministry of National Defense said the transfer ceremony was part of efforts to heal the scar left by the war and carried the message to enhance regional peace and stability. Any additional remains that are discovered will be returned to China, it said during a meeting convened in Beijing in January. The ministry pledged to maintain cooperative relations with its Chinese counterpart and continue the transfers as part of the development of bilateral relations. This year's transfer is also the first since China's Ministry of Veterans Affairs was[MG_SEO] created in April last year to better safeguard the welfare of veterans. About 200,000 martyrs of the Chinese People's Volunteers were listed by China's Ministry of Civil Affairs in 2014, with most killed during combat and buried on the Korean Peninsula. The transfers used to be overseen by the civil affairs authorities.